Can Tetanus Infection Result In Acquired Talipes Equinovarus? Background: Acquired talipes equinovarus is usually seen in conditions such as post-polio syndrome, cerebral palsy, meningitis and sciatic nerve damage. However, it may be possible in any condition favouring contracture development. Aim: The aim of this article is to report a case of a 7 year old child who developed acquired talipes equinovarus following tetanus infection. Method: The talipes equinovarus was managed initially for 2 days using manual stretching, and later on using serial casting and wedging. Result: The serial casting and wedging for 18 days resulted in plantigrade foot position. Conclusion: Tetanus infection is characterized by generalized body spasms and rigidity. In the presence of spasms and rigidity contracture may develop, and if this affects the foot, talipes equinovarus may develop. However, early mobilization of the foot can help prevent contracture and subsequently talipes equinovarus. Talipes equinovarus can be either congenital or acquired (Barker et al., 2003; Macnicol et al., 2003). The incidence of the congenital type varies considerably from 0.6 to 6.8 per 1000 live birth (David & Johnson, 1993; Barker et al., 2003; Paton et al., 2010). For the congential type, many factors such as genetic and breach birth (Wynnne-Davis, 1972), maternal smoking (Honein et al., 2000), prenatal exposure to ectasy; methyl enedioxyme methamphetamine (McElhatton et al., 1999) and intrauterine crowding or positional effects (Wynne-Davis, 1964) have been implicated.Acquired talipes equinovarus is believed to have neurogenic causes such as poliomyelitis, meningitis, sciatic nerve damage and vascular causes (Volkmann Ischaemic Paralysis) (Anand & Sala, 2008). Previous reports have associated the acquired type with conditions such as spina bifida, myelomeningocele, sacral agenesis, arthrogryposis, congenital myopathy, constriction-band syndrome, Freeman-Sheldon syndrome (distal arthrogryposis), fetal alcohol syndrome and Down’s syndrome (Barker et al, 2003; Macnicol, 2003). However, there seems to be no previous reports associating talipes equinovarus with tetanus. Tetanus is a serious bacterial infection of the nervous system caused by Clostridium tetani, a bacillus which secrets tetanospasmin that causes muscle spasm and rigidity (Longmore et al, 2004). Spores of the bacteria live in feces, soil, and dust and on instruments that can get into the body through a tiny breach in skin or mucosa such as due to burn, cuts, ear piercing and banding of piles. When the spores germinate, a toxin known as a tetanospasmin is produced and this travels up the peripheral nerves and interferes with inhibitory synapses (Longmore et al, 2004; Scwab & Thoenen, 1976). According to Longmore, et al (2004), signs of tetanus appear from 1 day to several months from the injury which include fever, malaise, headache, and then later, the classical features which include trismus, risussardonicus, spasm and autonomic dysfunction. The spasm if not controlled quickly may lead to an extensive contracture of skeletal muscles and other soft tissues. Consequently, the possibility of a patient with tetanus developing acquired talipes equinovarus seems eminent. The aim of this article is to report a case of a 7 year old child who developed acquired talipes equinovarus 13 days post manifestation of symptoms of tetanus. The child was seen as part of a routine Physiotherapy service, and therefore did not require institutional ethical approval. However, the child and his father gave consents for the report to be published for the sake of knowledge dissemination. This study describes a case of a 7 year old child who had thorn prick on the plantar aspect of the left foot in which he developed generalized body spasm a week later, and was admitted at the paediatric ward of General Hospital Gummi, Zamfara-Nigeria. Unfortunately, he was referred for physiotherapy 3 weeks later after developing contractures of the left tendon Achilles and tibionavicular ligament with the foot in about 50 degrees of plantar flexion. Through a thorough clinical assessment by the physiotherapist (AA), an acquired talipes equinovarus of the left foot was diagnosed which was later confirmed by the American Academy of Orthopedic Surgeons on the physiotherapist’s request (Figure 1). The intervention initially consisted of daily manual stretching which started immediately after the referral. However, following 2 days of manual stretching, intense pain during the stretching and the recurrence of the foot to the talipes equinovarus deformity after the stretching necessitated the decision to use serial casting and wedging. The objective of the serial casting was to correct varus deformity, plantar flexion deformity and medial rotation deformity of the forefoot. However, the materials for the casting were not available until 6 days later. On the first day, the foot was manipulated into eversion and the forefoot medial rotation deformity was corrected to normal with the foot in approximately 30 degrees plantar flexion, and the lower leg casted to 7cm above knee. Isometric exercise of the quadriceps and dorsiflexors was also taught to the child to be practiced as often as possible. Additionally, limb elevation was emphasized. On the 3rd day, the foot was wedged to approximately 10 degrees plantar flexion. On the 5th day, the foot was wedged to approximately 5 degrees plantar flexion. 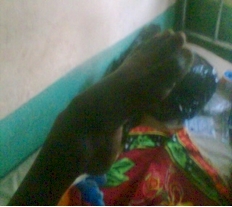 However, the child reported intense pain at the left ankle joint, in which he was reassured by the therapist. In spite of the reassurance, patient didn’t sleep well that day. Therefore, the following morning, the child was given oral analgesic and reassured. Consequently, he was able sleep well in the night. Nonetheless, on the 7th day, the child complained again of the pain at the ankle joint, and therefore the cast was removed completely to allow for the inspection of the whole leg. Fortunately, no pressure point was observed throughout the casted part. As a result, the foot was manipulated into eversion, forefoot rotated laterally and plantarflexed to approximately 5 degrees and casted finally. On the 9th day, the foot was wedged to approximately 0 degrees dorsiflexion (neutral position), and the child was discharged home the following morning. He was then asked to report in 1 week. 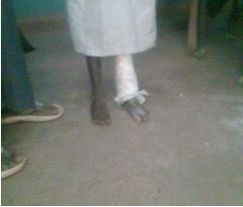 The patient reported on day 18, and the cast was removed completely. The foot was found to be no longer resistant. However, atrophy of the left calf was observed as the child was walking with a pathologic gait due to focal muscle weakness. When a tape measure was used to measure calf muscles girth, a difference of about 2.5 cm was recorded between the left and right lower legs. Notwithstanding, the child was able to bear weight on the left foot in plantigrade position with success when instructed. Therefore, the child was asked to report in a week’s time (Figures 2 & 3). In the classic literature, Acquired talipes equinovarus is seen normally in post-polio residual paralysis, cerebral palsymeningitis, sciatic nerve damage and Volkmann ischaemic paralysis (Paton et al., 2010; Anand & Sala, 2008). However, theoretically it can happen in any condition favouring contracture development in the soft tissues of the foot. In this report, it was seen following tetanus infection. Tetanus is a bacterial infection in which the causative agent secrets tetanospasmin that causes generalized muscle spasm and rigidity (Longmore et al., 2004). Hence, the condition has a great potential of causing contracture development, and subsequently talipes equinovarus. Traditionally, 2 methods of management of talipes equinovarus exist. These methods are operative and non-operative methods (Siapkara& Duncan, 2007). In most cases, the non-operative method can help delay or avoid the operative method. In the non-operative method, Posenti and French methods are effective and very popular (Richards et al., 2008). The Posenti method uses a weekly manipulation and casting; whereas the French method uses daily manipulation, stimulation of the muscles of the foot and temporary immobilization to correct the foot. In the present report, a method similar to Posenti was used. The method used a more frequent manipulation and casting than the traditional Posenti method. The result seen after the serial casting could be attributed to the viscoelastic properties and behaviours of tendons and ligaments of the affected muscles in talipes equinovarus. Stress relaxation, the decrease in force needed to maintain tendon length overtime when constant and repetitive load are applied, and creep, the gradual lengthening of tendon under constant load are the viscoelastic, time dependent behaviours of normal tendons (Schatzmann et al, 1998). Contracture is preventable with passive mobilization and/or splinting (Salksky & Donald, 2012). Thus, in the presence of spasm and rigidity in people with tetanus infection, early passive mobilization and/or splint can help prevent contracture and subsequently Acquired Talipes equinovarus. Therapeutic positioning can also help to prevent contractures. Unfortunately, hardly in our settings are children with tetanus infection referred for Physiotherapy before any complications set in. As the saying goes ‘prevention is better than cure’, Physiotherapists can help prevent many complications such as musculoskeletal and cardiopulmonary. Tetanus infection is characterized by generalized body spasms and rigidity. In the presence of spasms and rigidity contracture may develop, and if this affects the foot, talipes equinovarus may develop. However, early mobilization of the foot can help prevent contracture and subsequently talipes equinovarus. Adams JC (1981). Outline of orthopedics, 9th ed. London: William Clowes Limited, 416-21. Anand A, Sala DA (2008). Clubfoot: Etiology and treatment. Indian Journal of Orthopedics, 42(1): 22–28. Barker S, Chesney D, Mieckybrodzka Z, Maffulli N. Genetics and epidemiology of idiopathic congenital talipes equinovarus. J PedOrthop2003 ; 23 : 265-272. David H, Derek IJ (1993). Essential Paediatrics, 3rd ed. Edinburgh: Churchill Livingstone, 271-2. Honein M, Panlozzi L, Moore C (2000). Family history, maternal smoking and clubfoot: an indication of a gene-environment. Am J Epidemiology, 152: 658-65. LongmoreM,Wilinson, IB, Rajagopalan, SR(2003). Oxford Handbook of Clinical medicine, 6th ed. London: Oxford University press. Macnicol MF. Aspects of current management. The management of clubfoot: issues for debate. J Bone Joint Surg2003 ; 85-B : 167-170. McElhatton PR, Bateman DN, Evans C, Pughe KR, Thomas SH (1999).Congenital anomalies after prenatal ecstasy exposure. Lancet , 352(9188): 1441-2. Mercuendo JA, Dolan, LA, Dietz FR, Posenti IV (2004). Radical reduction in the rate of extensive surgery for clubfoot using the posenti method.Paediatrics,113(2): 376-80. Schatzmann L, Bruner P, StaubliHU(1998). Effects of cyclic preconditioning on the tensile properties of human quadriceps tendon and patellar ligaments. Knee surgery, sports Traumatology and Athroscopy, 6(1):56-61. Schwab ME, Thoenen H (1976) Electron microscopic evidence for a transsynaptic migration of tetanus toxin in spinal cord motoneurons: An autoradiographic and morphometric study. BrainRes, 105, 213–227. Siapkara A, Duncan R (2007). Congenital Talipes Equinovarus: A Review of the current management. Bone Joint Surg [Br] 2007; 89-B:995-1000. Skalsky AJ, McDonald CM (2012). Prevention and management of limb contractures in neuromuscular diseases. Phys Med RehabilClin N Am. 23(3): 675–687. Wynne-Davies R(1972). Genetic and Environmental factors in the etiology of Talipes Equinovarus. Clinorthop, 84: 9-13.